I have a little problem. I am trying to evaluate the response time of a parametrized request and I see that StresStimulus is grouping the request and returning back as result the average of all of them. As you can see, the request is parametrized. When I go to the Request Details, this request is not displayed in detail, one for each call with its parameter. The amount of requests is right in the report, but for example this request was called 3 times, one for homepage, one more after the user log in and the last one when the user logs out. All these request are called 3 times each one, but when I go to the request details i cannot see them detailed one by one. I have tried the different options that the tool is offering but none of them displayed me the detailed requests. Is it possible to view the detailed list? am i doing something wrong? To clarify, I would like to see the detailed requests as Fiddler does. I am sending an excel file so you can see the complete list of the requests. Sorry If i am disturbing you. The Detailed Request section shows details for each request, but not for each request's iteration. But you can easily recall detailed information from Fiddler using our new "Show" feature. Select all (let say, 10) of your GetImage? 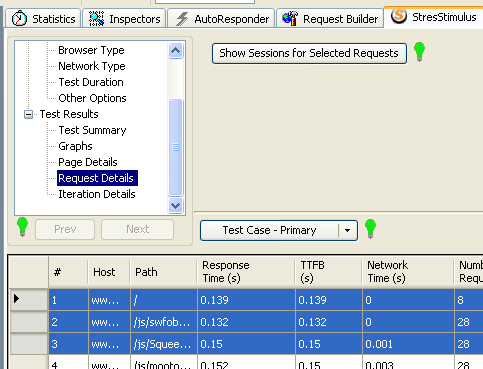 requests and click "Show Sessions for Selected Requests". Fiddler will display all 30 sessions in the grid. The column "Custom" will display the response time for each of the individual requests that as you've mentioned you need to evaluate.